In a 1756 manuscript, don Ignazio Bardea describes a fresco present, at that time, on the circular wall of the so-called Kuèrc, in Bormio. The artists who intend to participate in the Contest are invited to propose a piece of work whose theme would be the contents of the fresco in the Kuèrc. ‘… I was lead in the square to a lodge called the Cover . At the end of the lodge it can be seen a series of seats arranged semi-circularly, above of which are painted the insignias, or public hives , despite the christians’ concerns, horns and crosses are together. It can be also seen the figure of a genius representing justice , and above this, in the corner, the image of a night bird . Footnotes, along with the mentioned pictures, can support the description of Bardea. Built in 1387, the construction was named after a term from the local dialect, which means “cover”. In it, during summer, the people’s council gathered to administer justice. Bardea describes the fresco present in its semi-circular walls at the end of the building, above the benches (‘seats’). Probably, a major fire in 1855 destroyed the mentioned fresco. PICTURE 2: Coats of arms of the Three Grey Leagues, Meraldi House, Cavour square. From 1512 to 1797, Bormio, in order to maintain its own independence and regulations, was subjected to the Grey government. To this day, in the village there are still numerous heraldic emblems showing the insignia of the League of God’s House (Alpine ibex), the League of the Ten Jurisdictions (a cross combined with a spearman) and the Grey League (cross). PICTURE 3: Coat of arms of the County of Bormio. A white cross over a red field constitutes the coat of arms of Bormio. 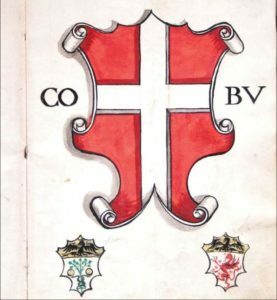 The origin can be attributed to the ’Blutfahne’ (Bloodflag), adapted from the Holy Roman Empire, insignia which later became the symbol of the city of Como, and thus, of Bormio. The insignia, rich in meanings and symbolisms, was often depicted as an element of independence and civic pride, as well as a sign of belonging to the Communitas (Community). For this reason, in any historical period, was present in palaces, signs, seals and flags. 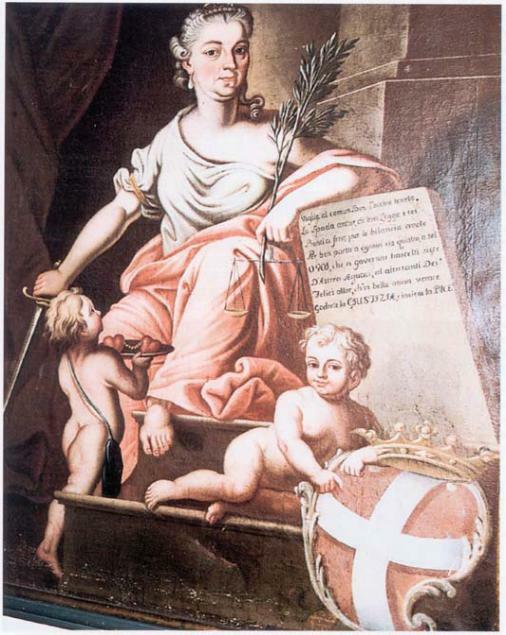 PICTURE 4: Justice, Civic Museum of Bormio. G. Telser, 1777. Oil painting. A Justice character with a grim and a severe nature is the one that has overseen and watched the conduct of the Bormio people. The painting portrays this subject according to classic iconography of the woman which with one hand bears the scales, the other grips the sword and above her head stands the all-seeing eye that watches and judges all. A moralistic title block provides a more intense respect to the expressed iconographic message. 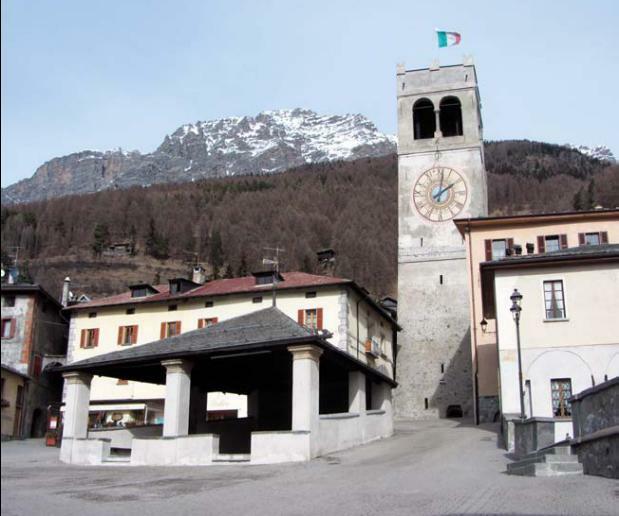 The insignia of the town of Bormio evokes guarantor and guardian authority of the justice within the community. PICTURE 5: Bat. Made in 2016 by the Bormio’s artisans Giovanni Rossi and Adriano Clementi, on the occasion of the opening of the painting contest. Il Coperchio (lit., `The Cover’), is the Kuèrc (Picture 1: Bormio square, and the Kuèrc in the centre). “Insegne o arnie pubbliche (insignia or public hives)”. It refers to the coat of arms of the Contado di Bormio [County of Bormio] (Picture 3), and the coat of the Tre Leghe [Three Leagues] (Picture 2). 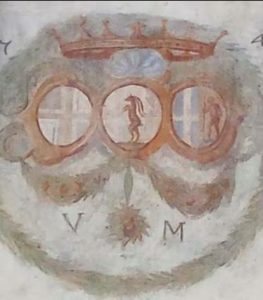 Don Ignazio says in his description that the ‘horns and crosses’, present at the emblem of the Tre Leghe, were perhaps erroneously arranged because the first represented the Protestant majority in the state of the Tre Leghe. Il genio della giustizia (The Genius of Justice). For more information, at the Civic Musem of Bormio (Museo Civico di Bormio) a coetaneous painting from 1777 is preserved (Picture 4). L’uccello notturno (the night bird) is a bat (Picture 5). The description of the fresco by Bardea is only limited to the insignias, the genius of justice and the bat. Due to the absence of other elements, anything that is missing should come from the artists’ creativity.